For thousands of years, massage has been recognized as a way to treat muscle pain. The earliest massage techniques involved applying pressure to affected areas with hands, fingers, elbows, forearms, and even feet and knees. 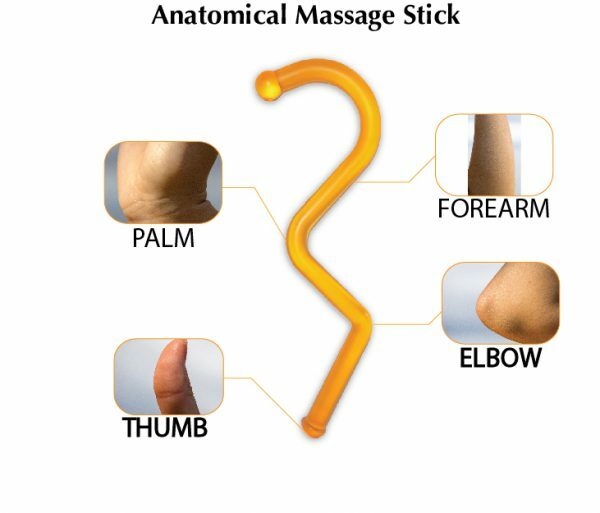 The TP BuddieRx massage stick has been specially designed to replicate the feeling of an actual elbow, palm, or thumb technique during massage; that is, this massage tool has human anatomical features (Figure 1). Figure 1: Anatomical design based on human structures. The choice of the anatomical feature to use largely determines the pressure or “feel” of the tool during the massage. For example, the “thumb” and “elbow” concentrate your applied force more than the “palm.” This is an advantage over other tools, like balls or foam rollers, where the pressure is determined by gravity and body weight. The TP BuddieRx is also designed to be easily used on yourself (as a self-massage and treatment tool), on a friend, or as a professional on your clients (IASTM). The TP BuddieRx offers tremendous versatility as a self-massage and treatment tool. For example, the tool can act as an extension of your fingers to get to hard-to-reach areas or give you the “feel” of an elbow even though you can’t easily use your own elbows on yourself. This results is a more satisfying self-massage, as close to the feeling of what a professional massage feels like because of the anatomical design. In fact, our studies indicate that the feeling of the tool (when warmed to body temperature) is virtually indistinguishable from an actual thumb, palm, etc. Also, using the TP BuddieRx rather than your own hands greatly reduces the risk of damaging the delicate joints of your fingers through repetitive stress. When added to your daily Self-Care regime, the TP BuddieRx is especially useful to release muscle knots in the front of the upper body and shoulders, as well as the entire posterior and anterior muscle groups of the lower body. In our blog, we have created body specific methods in our videos to help you use the TP BuddieRx to deactivate specific trigger points localized in particular muscle groups causing pain in your shoulder or neck. Below is a step-by-step guide to using the TP BuddieRx to treat a non-specific painful area of your body or someone else’s body. Although we all seem to instinctively know to just “massage where it hurts,” here we give detailed steps to treat non-specific muscle pain with the TP BuddieRx whether it is caused by a trigger point, knot, or simply generalized muscle soreness. Start every muscle recovery session as if you will find sore spots or pre-injuries. Start using your fingers to “scan” an area by gently probing and rubbing with your index and middle finger to find pain and feel for constricted or lumpy tissue. For example, shoulder pain during daily activities would prompt you to scan the muscles in the vicinity of that shoulder and perhaps you find that the trouble spot is a lumpy area in the upper part of the front of your arm (anterior deltoid) that replicates the shoulder pain when you press on it. You can also use the TP BuddieRx to scan for sore spots by holding the tool as described in Step 2 and pressing and rubbing up/down or side-to-side with the chosen anatomical feature (thumb, palm, etc.). After locating the trouble spot, you then decide which anatomical feature of the TP BuddieRx to use, which will determine how you hold the tool. The TP BuddieRx can be held in one or both hands in various ways. Holding the TP BuddieRx, center your chosen anatomical feature on the trouble spot and with light-medium pressure move up/down (or side-to-side) to get a feel of the muscle landscape and then seamlessly transition to a press-and-hold action: press and hold for 3-5 seconds, then use small kneading motions to “smooth out” the tissue, and then let go. This process seems to “unlock” constricted fibers and dissipate trigger points. Repeating the press-and-hold action a few times for several minutes should alleviate some of the pain and reduce the size of the affected area. 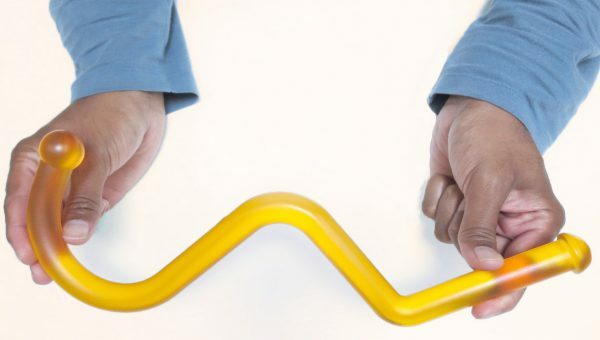 There will temporarily be more pain when you press, but it should feel effective, or satisfying, as the trigger point “releases.” If you “slip over” the “knotted up” area when you press on it, adjust the pressure and position the tool to stay on top of it. Therapeutically treating muscles means not over-traumatizing them or the skin. Always start off slowly, with less pressure, and progress to more pressure later. In simple cases where you are dealing with a knot the size of a grape, you will recover in a day or two by repeating Step 3 (press-and-hold) a couple of times a day. Chronic larger-sized knots will take weeks of daily self-massage. At first, aim to reduce (not necessarily eliminate) the painful area. Some find it effective to first work on the edges of larger muscle knots, before working the center, which may be quite painful. Like most troubles, treating trigger points when they are small and as soon as they show up is the best strategy. Pro Tip: The use of a skin lubricant may also be useful during the massage. Ordinary body lotion can work. Many find adding a dab of coconut oil to be a good, natural choice. Other ways to reduce friction is to use over leggings, yoga pants, or even hair can act as a lubricant. It helps to stretch the treated muscles, which is recommended after each session; our blog and videos include information on stretching specific muscle groups. To get the most from your muscles means helping them heal after using them. Whether you are an injured athlete, or just sore from yesterday’s yoga class or gym workout, you will want to include the TP BuddieRx in your daily Self-Care regime because it is so effective and easy to use while sitting in a chair, watching TV, or stretching on the floor. With the TP BuddieRx, you can accurately control the amount of pressure, how it is applied, and where it is applied. This can be contrasted to tools like foam rollers or lacrosse balls which do not afford you such control. Because of its portable size, you can easily pack the TP BuddieRx for the office, gym, or when traveling. The TP BuddieRx is effective for treating specific trigger points in muscles and helping with muscle recovery after all your physical activities and workouts. The fact is, after your workouts, you will be sore and this is the best time to commit to a regular muscle recovery regiment. It’s commonly known, your next workout is only as good as the time you spend on muscle recovery today. Commit to daily self-recovery and self-care to get the most out of your muscles and live more life. PrevPreviousWhat Is Trigger Point Therapy?